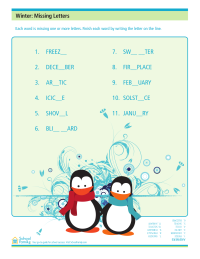 Rearrange the letters in each word to make a list of words related to winter. Each winter-related word is missing at least one letter. Figure out which letters are missing in this activity. 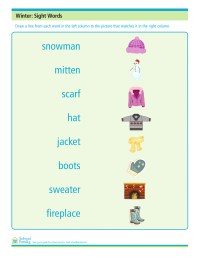 Practice reading winter-related sight words. Draw a line from each word in the left column to the picture that matches it in the right column. Rearrange the letters in each word or phrase to make a list of words related to sports played during the Winter Olympics. 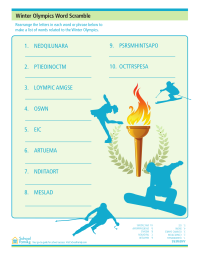 Rearrange the letters in each word or phrase to make a list of words related to the Winter Olympics.